Kiev is pocketing the money it has to transfer for social payments in war-torn areas, the rebel leaders said, calling on Germany and France to put pressure on President Poroshenko. Ukrainian officials claim they cannot transfer the pensions. “We are calling on you as the guarantors [of the Minsk agreement] to use leverage on the Ukrainian leadership and make it follow [the deal] and resume social payments to the citizens of Donbass, to demand from the Ukrainian side that they stop ignoring the Minsk agreement,” Igor Plotnitsky and Aleksandr Zakharchenko wrote in an address to the German and French leaders. The complaint was voiced in a joint letter they sent to Chancellor Angela Merkel and President Francois Hollande, who co-sponsored and endorsed the Minsk agreement in February last year. The quarrel over pension money adds to the many points of contention between the Ukrainian government and the rebel forces in the east. In November last year, Kiev announced it would not pay any social benefits in rebel-held areas as part of its strategy to blockade them. But in February it pledged to revoke the decision during negotiations in Minsk, which produced a ceasefire agreement between the government and the rebel forces. But according to the self-proclaimed Donetsk and Lugansk People’s Republics, Kiev is not willing to deliver on its commitment and is not transferring the money it owes to the pensioners. “The Ukrainian leadership is… continuing the blockade, including that of the Donbass banking system. It is stealing the pensions of more than a million people, leaving them with nothing to live on,”the entities’ heads said. Ukrainian officials say paying the pension is impossible. “We physically cannot do it. I stress that the government is ready to deliver on its obligations in full, but we physically cannot do it,”Kiev military campaign spokesman Andrey Lysenko told TV channel 112. He cited the damage done to the offices of the state-owned bank responsible for delivering the pension as the main stumbling block. Rebel officials said most of the offices are in working order and ready to process the payments. “The offices of the banks and the pension fund are fine. They have the necessary equipment and staff. Nobody has left even though Kiev has been trying to lure them away,”Denis Pushilin, a senior official in the self-proclaimed Donetsk People’s Republic told RIA Novosti, inviting Lysenko to come and see for himself. The Ukrainian Justice Minister Pavel Petrenko said in an interview that the pensions would only be paid after Kiev regains control over all the Donetsk and Lugansk regions: “When we are in power there and can ensure that the money gets through to the people.” He added that the alternative would be for pensioners to leave rebel-held areas and apply to the proper social security authority. “We have no technical capability to send the money into the occupied territories,”he stated on the Ukraina TV channel. Both the spokesman and the minister were commenting on last week’s ruling by a Kiev court, which said the November presidential decree ordering the payment of the pensions to be suspended was unconstitutional. “Pensions and social benefits from the state must be paid to all citizens who are entitled to them according to the Ukrainian constitution and laws in the entire territory of Ukraine as recognized by the authorities, regardless of where the persons entitled to such pensions and benefits live,”the ruling said. The Ukrainian pension fund lacks some $3.4 billion it needs to pay all due pensions, Social Policy Minister Pavel Rozenko told the First National TV channel. “Speaking plainly, the fund is bankrupt and without aid from the state this financial institution will not be able to continue to exist,”he said. 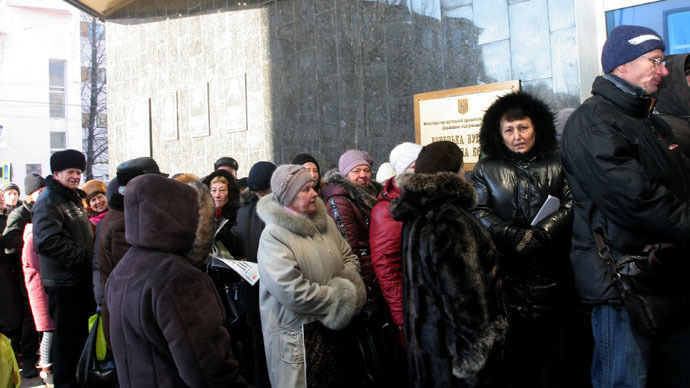 Amid the quarrel with Kiev over pension money, the Donetsk government said it would start paying pensions in April. This would require some $33 million each month and would provide retirement income for some 500,000 people, the self-proclaimed republic’s pension fund reported. The Lugansk government had intended to start paying pensions on April 3.